1. 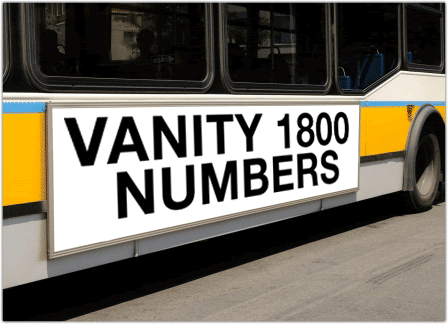 There’s more than one way to get a vanity 1-800 number, if it’s available. In fact, there’s really only two ways: You can rent a toll free number or own it. With UniTel Voice, you own your toll free vanity number with no strings attached. You can even port your 800 number to another provider of your choice at any time. There are some toll free service providers that rent vanity 1800 numbers to businesses in certain geographic regions. For example, let’s say you are a plumber based in Chicago. You could rent the vanity number 1-800-PLUMMER and when people in the Chicago area call the number they get you. However, that same number could be rented to a plumber based in New York and when people in the New York area call the number they get the New York-based plumber. The upside to renting vanity numbers is you can usually find a great 800 number available for rent. Toll free number availability (especially 800 numbers) is higher when it comes to renting. Finding 800 numbers for sale is a bit harder. However, the downside to renting is the cost. It’s super expensive to rent a vanity number and if you decide you don’t want to pay such a high rate for your 1-800 number anymore, you can’t switch to another provider because you don’t own the number. Owning your vanity number is definitely the way to go because your number is a major business asset. Think about how much time and money you invest marketing and advertising your vanity 800 numbers to current and prospective customers. Unfortunately, you would be wrong about the 800 number’s availability. Just because the number sounds disconnected doesn’t mean the number isn’t “in use”. It likely means the number is simply not forwarding to another number or the phone number it is forwarding to has been disconnected. And even more, unfortunately, there’s absolutely no way of finding out who the owner of the number is. The closest you could come is figuring out what phone company is providing service to the 800 number but if you call that phone company they will not provide you with their customer’s phone number or offer to put you in touch with the owner of the number. Customer account info is kept private. 3. Why is it so hard to check the availability of 1800 numbers? True “800” numbers are almost all in use. Therefore finding an available vanity 1-800 number is much harder than other toll free number prefixes like 888, 877, 866, 855, 844, and 833. In fact, the best time to get a vanity toll free number is right after the FCC releases a new prefix – which just happened with 833 toll free numbers. If you want a great vanity 833 number – now is the time.